JACOB COLON TTN. Fred Murphy, a professor at Fox, displays his winning redistricting plan. The city wide contest helped promote transparency and public input in the redistricting process. A professor recently entered a city contest on redistricting. His plan emphasized compactness. Looking at a map of Philadelphia’s councilmanic districts, it’s easy to differentiate scribbled gerrymander from contiguous boundaries. But Philadelphia City Council has called for a resolution to confront its heavily gerrymandered districts, asking for an “open and transparent process and opportunity for public engagement and input,” at its June 16 meeting. 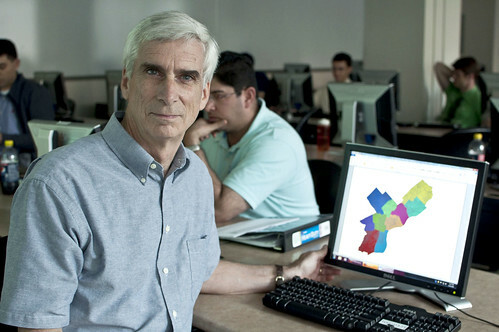 Dr. Fred Murphy, professor of management science and operations research at the Fox School of Business, teamed up with four other collaborators from neighboring universities to enter a contest that called for the public to create their own versions of how the city’s district boundaries should be redrawn. The contest, co-sponsored by Azavea, a geospatial analysis software company, launched on Aug. 5 through the website fixphillydistrics.org, to deal with the redistricting problem. The winner would receive a $500 prize and the top three would have the chance to present their plans to City Council. Murphy’s team’s entry, which competed among 1,200 others, called for more condensed districts in the contest. The plan won the compactness category. “The current districts are pornographic,” Murphy said. Murphy’s plan seeks to reshape and compact Philadelphia’s districts. He said his plan is not perfect, but fits the needs of some public officials like Councilwoman Maria Quiñones Sanchez, said she is fed up with the current shape of her district. Quiñones Sanchez was elected councilwoman of the Seventh District, which Main Campus falls under, in 2007. Sanchez said she would like to see consolidation of the Third and Seventh districts, which would increase representation for the Latino community. Dr. Joseph McLaughlin, director of the Institute for Public Affairs and assistant dean for external affairs for the College of Liberal Arts, argued that “districts respect[ing] communities’ interests” is more important. “Compactness is an aesthetic value,” McLaughlin said. Redistricting is mandated by the United States Constitution to capture population shifts in an effort to better represent people, every 10 years. In Philadelphia, it takes places six months after the federal government releases its census data. Murphy and McLaughlin agree that gerrymandering has become a pervasive practice in the political system and that it adversely affects the electorate. McLaughlin said a more balanced criteria is important when designing district lines. McLaughlin said that it is imperative to take some factors into account when considering districts, such as social equality, compactness, respect for communities’ interest, fair representation for minority groups and the avoidance of putting incumbents in the same district. “Redistricting would have a small effect on Temple since student turnout for local elections has historically been low,” McLaughlin said. Redistricting also has a direct impact on students, Murphy said. City Council is expected to vote on Thursday, Sept. 22, on a plan. None of the Azavea plans are being considered for a vote, but the top three plans were presented for public hearings. Josue Mercado can be reached at josue.mercado@temple.edu.